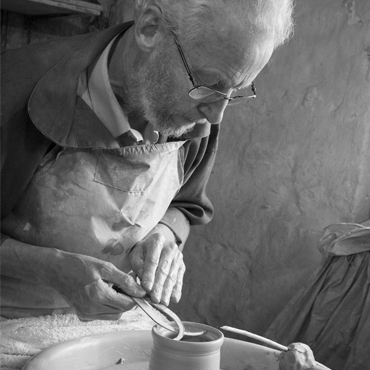 As the eldest grandson of Bernard Leach and son of David Leach, John was fortunate to be given the best possible training as a potter and to be able to continue the family tradition, making honest, hand-thrown pots in his own 16th century, thatch-roofed pottery at Muchelney in the beautiful English West Country. His range of stoneware kitchen pots using local clays has been in constant production for over 50 years but his greatest joy is in creating his one-off designs. Some are fired in sawdust-filled saggars, producing exciting black pots with unpredictable markings. Others explore his fascination with antique leather bottles, African and early English and American pottery. A selection of these signed, collectable pots is available in the John Leach Gallery at Muchelney and through this website. Nick began potting in 1972 when he joined John for an apprenticeship at Muchelney Pottery. 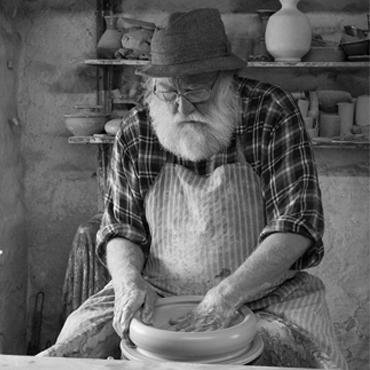 Apart from a three month stint with Brian Newman at Aller Pottery in 1976, Nick has remained at Muchelney as a Master Potter for over 40 years. Nick's days are spent producing the catalogue range of oven-to-tableware at Muchelney Pottery. Parallel to this he has developed his signed range of work where he explores surface detail, creating distinctive pieces which are sold through a number of galleries, including the John Leach Gallery where there is a permanent display of work available. 2009 saw Nick begin a new journey exploring the possibilities of oxidised firing in an electric kiln which has added a new dimension to his work. He also continues to wood-fire his pots in the three chambered climbing kiln at Muchelney. Mark trained at Muchelney Pottery before spending four years in West Africa as a VSO volunteer - kiln building, training and making pots. In 1998 he established his own pottery in Somerset and developed a strong tableware range combining ideas and influences from African and English country pottery. 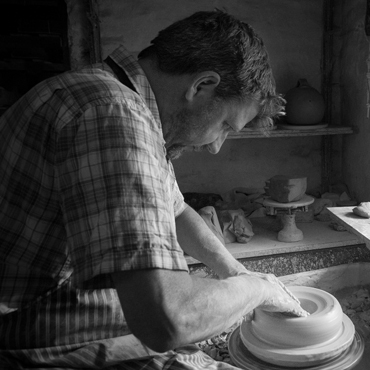 In 2002 Mark rejoined the Muchelney Pottery crew full time. A selection of his work can always be found at the John Leach Gallery.